Our beautiful hand crafted carts are a must have at any event to add that extra special touch and appeal to all ages. So why not treat your guests to a tasty selection of sweets and treats. Whether these sweets evoke childhood memories, are quirky and retro or even something more modern, they are a guaranteed crowd pleaser. 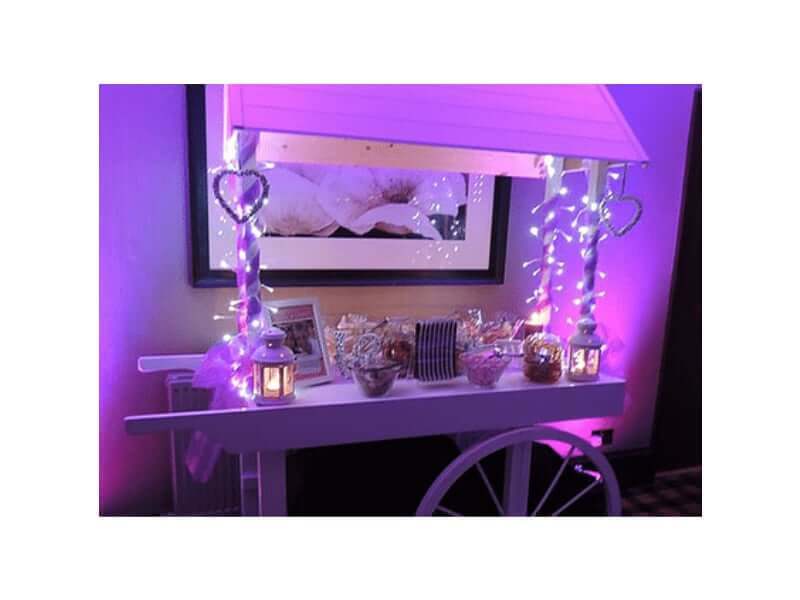 Our gorgeous candy carts can be dressed to suit your style, colour and requirements by choosing a package best suited to your event. This includes colour co-ordinated voile, bows and candy bags for your guests to fill to the brim with sweet treats. You can choose from an ever growing selection of sweets on offer to fill our lovely glassware. Our hire also includes stunning LED fairy lights, diamante scatter crystals and use of tongs and scoops. Our fully trained staff will arrive at your event and set up everything you need to give your candy cart the WOW factor. Our friendly staff are always presentable, wearing our smart uniform and will remain at your event for the duration of your hire in order to replenish the treats and keep the cart and surrounding area perfectly tidy. We look forward to being part of your special event!